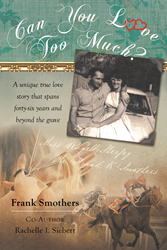 “Can You Love Too Much?” from Christian Faith Publishing authors Frank Smothers and Rachelle Siebert tells the story of a man and his beloved wife. After four months of exchanging letters, Frank finally met and married Runelle, which marked the beginning of a lifelong love. “Can You Love Too Much?”: the story of the true love shared by Frank and Runelle Smothers. “Can You Love Too Much?” is the creation of published authors, Frank Smothers and Rachelle Siebert. Frank Kelso Smothers Jr. was born in the State of Washington in 1926. He had three younger siblings. He became a horse racing jockey and rode across the country. Frank served in World War II in the army from 1944 to 1946 then, again in the Korean War from 1950–1951. Published by Christian Faith Publishing, Frank Smothers and Rachelle Siebert’s new book proves true love is timeless. In 1963, Frank Smothers was convinced to start writing letters to a young lady in Kentucky. Frank and Runelle wrote over two hundred letters to each other, but did not meet face-to-face until four months later on the day they were married. They lived in California for twenty-eight years where Runelle worked as a hairdresser and Frank as a custodian of the Racing Silks at the Southern California race tracks. It was a marriage full of love and laughter. When Frank retired in 1990, he promised Runelle he would bring her back to Kentucky. In 1992, they moved to Bowling Green. Frank and Runelle enjoyed living in the country with their dog, Peanuts, where they watched their daughter graduate college, fall in love, and marry. In 2002, they became grandparents. In January of 2010, Runelle fell ill with the flu and passed away in the hospital three weeks later. Frank was at a loss. He attended a grief counseling class, wrote a journal, and earned his GED. Frank realized that God still had plans for him. Frank participated in the Honor Flight to Washington, DC. At ninety years old, he is currently in charge of the jockey’s room at Kentucky Downs in Franklin. He has a new little buddy, a dog named Friday, and they do everything together. They enjoy spending time with family as well as taking walks and naps in the recliner. View a synopsis of “Can You Love Too Much?” on YouTube. Consumers can purchase “Can You Love Too Much?” at traditional brick & mortar bookstores, or online at Amazon.com, Apple iTunes store, or Barnes and Noble. For additional information or inquiries about “Can You Love Too Much?”, contact the Christian Faith Publishing media department at 866-554-0919.